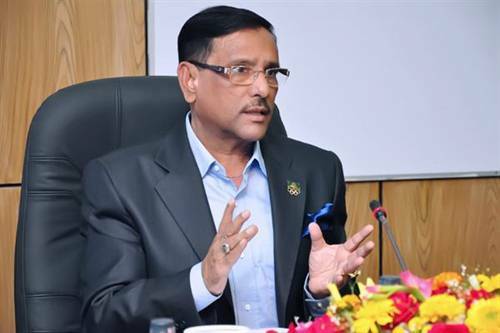 Awami League General Secretary Obaidul Quader on Monday smelled foul in the BNP’s participation’s in the three city corporations polls, saying the party joined the election race with a motive to create an issue ahead of the upcoming general election. “BNP has participated in three city corporations- Rajshahi, Barishal and Sylhet- polls to create an issue ahead of the general elections and to mislead the common people… BNP’s design was to make the election controversial,” he said at a post-election press conference at the party president’s political office in city’s Dhanmondi. Prime Minister Sheikh Hasina’s Political Advisor and AL Advisor Council Member HT Imam, AL Advisors Rashidul Alam and Mukul Bose, Presidium Member Dr Abdur Razzak, Joint General Secretary Mahbub-ul-Alam Hanif, Organizing Secretaries Khalid Mahmud Chowdhury and AKM Anamul Haque Shamim, Publicity and Publication Secretary Dr Hasan Mahmud, Office Secretary Dr Abdus Sobhan Golap, Cultural Affairs Secretary Ashim Kumar Ukil, Relief and Social Welfare Secretary Sujit Roy Nandi, Science and Technology Affairs Secretary Engineer Abdus Sabur, Forests and Environment Secretary Delowar Hossain and Deputy Office Secretary Barrister Biplob Barua, among others, were present. Quader said the BNP leaders banked on spreading falsehood from the very beginning of the three-city polls to create an issue for movement ahead of the parliament elections. “The conspiracy of BNP through boycotting election has been foiled fully, Quader, also the road transport and bridges minister, said, adding that the government has thwarted the party’s “evil attempt”. BNP’s mayoral candidate for Barisal City Corporation polls Mujibur Rahman Sarwar boycotted the elections with a motive to create an issue ahead of the national election, the AL leader said. In Rajshahi, BNP showed the signs of not winning the polls and the party’s mayoral candidate Mosaddek Hossain Bulbul staged a drama without casting his vote, he said. “No causalities took place during the three-city polls, and the election was held in a free, fair and credible manner,” Quader said.